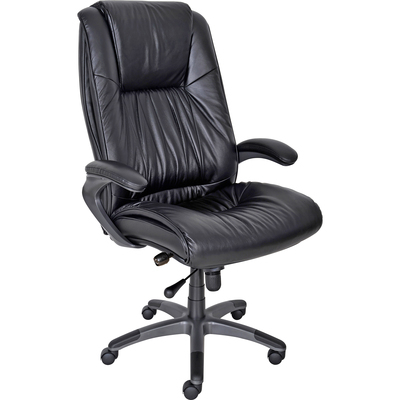 Ultimo Executive High-Back Chair Features Sculpted Dual-Density Foam, Genuine Top-Grain Cow Leather Upholstery, Built-In Lumbar Support, And Leather Padded Cantilevered Arms To Help Relieve Muscle Fatigue And Stress. Molded Foam Maintains Its Supportive Shape By Steel-Reinforced Nylon Ties. Functions Include 360-Degree Swivel, Pneumatic Seat-Height Adjustment, Tilt Tension, Tilt Lock And Synchronized Knee Tilt For Comfortable Reclining. Polished Aluminum Five-Star Base Offers A Powder-Coat Gunmetal Gray Finish For Scuff-Resistant Protection. Dual-Hooded Casters Provide Smooth, Quiet Mobility. High-Back Chair Holds Up To 250 Lb. And Meets Or Exceeds Ansi/Bifma Standards..